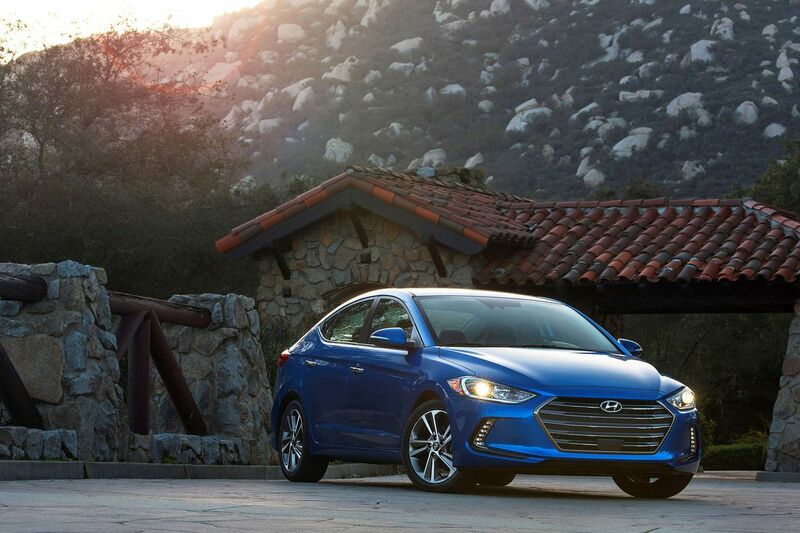 The 2017 Hyundai Elantra sedan gets a brand-new look for the model year and plenty of improvements, including better fuel economy. Price: $21,610 as tested. A base model starts at $17,150. Marketer's pitch: "It all adds up." Conventional wisdom: Edmunds.com likes that "classy and thoughtfully laid-out interior design; cabin is quiet at highway speeds; lots of technology and safety features," but not the "underwhelming 2.0-liter engine performance" or that the "base SE gets sparse standard features." Reality: More like a sleeper, as in unexpected contender. What's new for 2017: All-new styling makes the Elantra much more attractive these days. And Hyundai has managed to make enough incremental improvements in the Elantra that now it's quite a strong contender in the compact segment. Fuel economy: If you're going to call it Eco, I'd better start here. I last tested the Sport version, and I found performance to be worthy of the designation - but the fuel economy was not so strong at 28 mpg. But this time I achieved a tick under 36 mpg. Doing this without any hybridization strikes me as Eco mission accomplished. Up to speed: The 1.4-liter engine creates 128 horsepower, about the lowest number I've seen in a long while. I found the performance to be adequate; still, no necks were snapped in the making of this review. A Sport mode is available (in addition to Eco and Normal) and this made the acceleration a bit more lively. On the curves: Sport mode also helped the car handle less like a boat. Winding roads don't provide a feeling of joy, but there's a tinge of fun in them when Sport is selected. This is a dramatic improvement over previous models. Shifty: And even the seven-speed automatic transmission didn't remove the last traces of excitement, either; the shift function was clear and felt better than many Hyundais I've tested in the past. I didn't find the Elantra hunting around for the right gear when I left it in automatic mode. Stop-and-go traffic could leave a bit of lurching here and there, especially before a full warm-up. One episode worth noting, though: While rounding a corner and downshifting, either I put the car in first inadvertently or it went on its own, but for close to 10 seconds it would not upshift. I let off the gas, and moved the lever into Drive, but it only shifted when it was good and ready. Prospective buyers should check this story against other sources to see whether this might be a problem rather than just a one-off. Driver's Seat: The Elantra seating position has a lot of lumbar support, and left me feeling as if my head were two feet farther back than my spine. The seat also rides very low to the ground, and a lack of straight up-and-down mobility exacerbates this feeling. Tall drivers, though, should feel fairly accommodated by the headroom. Friends and stuff: Rear-seat passengers will find legroom and foot room a bit on the short side. Headroom is fairly adequate, especially considering the Elantra's size. A middle passenger doesn't have a large hump to contend with, but the front-seat console intrudes into foot space quite substantially. The seat also sits up higher, making cornering a potential king-of-the-hill knockdown. The trunk volume is a respectable 14.4 cubic feet. Play some tunes: Hyundai gives the Elantra its upgraded stereo, with dials for volume and tuning, and a row of buttons underneath to select sources. But plenty of touchscreen interface time means that accessing all the features can be challenging. Scrolling through the screen to pick a song was especially exasperating, as the system thought I was picking a song while I was scrolling, but then was balky when I actually attempted to pick a song. The sound rates a B+; it's pretty clear but misses a bit of midrange tones. Keeping warm and cool: Dials control the temperature for driver and passenger separately, while buttons turn the fan up or down, and also select where the air comes from. Pretty simple. Night shift: The Elantra headlights actually leave drivers in the dark. My usual routes over rolling Pennsylvania slopes mean that, in many locations, seeing was a challenge. Add to that overly bright map lights and driving after sunset could be a real challenge. Where it's built: Montgomery, Ala., and Ulsan, South Korea. How it's built: Consumer Reports expects its reliability to be average, same as in 2016. Previous models had rated a bit better. The 10-year, 100,000-mile warranty is still a great bonus. In the end: After years of liking the looks of the cute Elantra but not much else, I'm really starting to like the Elantra. But the headlights and the seat give me pause.